We offer premium quality Grain and Powder Packing Machine to clients at budget-friendly market prices. These machines are used for the purpose of packing grains and powder. 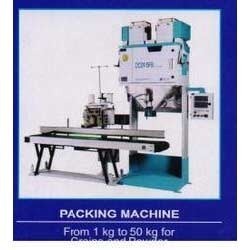 These sturdy and durable machines are used for the purpose of packaging owing to their efficiency. The rugged design of these machines makes them highly suitable for rough use. Being user-friendly, these machines are available to clients at highly reasonable market prices. Capacity: 1 Kg to 50 Kg. Established in the year 2006 at Delhi, we, North India Compressors, are among the leading Supplier and Trader of premium quality Industrial Air Compressors, Color Sorting Machine, Air Receivers, Modular Piping, SS Piping, Husk Burner, Rotary Lobe Blowers, Dryer for Raw Paddy and Cereals, Refrigeration Air Dryers, Micro Filter, Piping Spare Parts etc. These are manufactured using premium quality raw materials as per industry-specified quality guidelines. These are used along with compressors and are priced economically to suit the clients' budget constraints. We offer multiple specifications of compressor parts to clients at highly economical market prices within the specified period of time. The demand for these compressors is high in the market. Our products are highly acclaimed for their unmatched quality, durability and resistance to damage. Our commitment to offer the best quality products to clients has helped us stay ahead of other competitor firms in the market. Our client-friendly business policies have garnered us a loyal clientele.